This article explains ignition timing and how to set it for points ignition systems. The instructions are intended for mopeds with woodruff keys (Puch, Tomos, etc). Some of the concepts here may also apply to non-keyed (Moby, Peugeot, etc) mopeds, but some parts of the instructions will not work on non-keyed mopeds. Timing a bike refers to setting when a spark jumps the gap between the center electrode and the ground electrode on a spark plug and its relation to the rotation of the crankshaft. Adjusting when this happens is very important and can significantly affect how the bike runs. This has been achieved by using a mechanical system called points ignition for many years. Recently, advances in electronics have introduces the CDI (Capacitor Discharge Ignition). If you need to set the timing on a CDI ignition system, please read Ignition timing for CDI. TDC, or Top Dead Center, refers to the position of the crankshaft and piston when the piston is as close to the head (at the top of the stroke) as it can be. Please refer to the TDC page for three methods on how to find TDC. Generally speaking, it is easiest to set the points when the piston is at TDC. One of the "windows" in the flywheel should be over (or close to over) the points when the piston is at TDC, although this rule may not always apply, particularly for aftermarket or reproduction flywheels. (If you don't have a window in the right position, just get it as close as you can, and err on the side of setting them after TDC rather than before). Make sure that you are rotating the flywheel in the direction indicated by the arrow on the flywheel. First, check the manual for your moped/engine to see what the correct point gap is. Then, to set the points, loosen the screw that holds the points down. While the piston is at TDC, insert a feeler gauge (or an appropriately thick piece of cardboard or a guitar pick or whatever else) with the same thickness as your specified point gap between the contact points. Make sure the points are only open the thickness of the feeler gauge -- aka, that the feeler gauge is not twisted and causing the points to be more open than they should -- and then tighten the points screw back down. If you need to pry the points open, look for the notches near the outer edge of the points; you can wedge a screwdriver between one of those notches and the engine case or stator plate to help pry the points open. If your moped already has a "Fire" mark on the flywheel and you want to keep the stock timing, skip this step. The spark plug fires when the points open. Since the point of ignition timing is to have the spark plug firing at the correct time/point in the cycle, figuring out when the points are supposed to open is important. Most of the time, the manual will give a number or range of numbers in either mm before TDC (BTDC) or degrees BTDC for where the piston should be when the spark plug fires. Method 1: Use an ignition timing tool as explained in method 3 in the TDC article. For example, if you want to set your moped to fire at 1.8mm BTDC, rotate the flywheel until your timing tool indicates that the piston is 1.8mm BTDC, then make a mark on the flywheel that corresponds with the mark that you already made on your cases. This mark is now your fire mark. Method 2: Use a degree wheel. If your timing specifications are given in degrees, this is probably the easiest method. To use the degree wheel, line 0° up with your TDC mark and secure the degree wheel to the flywheel. If the manual says that your points should open 22° before TDC, then rotate the flywheel (in the direction opposite of the arrow on the flywheel) until the 22° (or 338° depending on your flywheel rotation) lines up with the mark on the case. Then make a mark at 22°/338° on the flywheel. This mark is now your fire mark. Method 3: Use math and some combination of the above two methods. If you know or can accurately measure the circumference of your flywheel (circumference = 2πr) you can use that to create a measurable distance and not have to mess with degree wheels or timing tools. The equation (dc)/360 = x where d is the degrees BTDC, c is the circumference of your flywheel, and x is the measurement you are going to make, should give you the correct measurement. (Or you can just cross multiply, if that makes more sense to you). For example, if your flywheel has a circumference of 10 inches, and the manual says the points should open 20mm BTDC, then you would multiply (10*20)/360 to get 0.555. Then, starting from your TDC mark, measure 0.555 inches in the direction opposite the normal rotation of the flywheel along the circumference of the flywheel. Make a mark at 0.555 inches, and that is your fire mark. If that was hopelessly unclear, see page 111 of the Puch manual for another description and an image. If your ignition timing is given in mm BTDC and not in degrees, don't despair. You can translate one measurement to the other using this handy calculator. You will need to know the stroke of your engine and the rod length. Input those variables at the top, and then use either 1 or 2° in the "Increment degrees by" box. The calculator will spit out a table of crank rotation degrees and the piston travel at each degree increment. If 360° (0°) are still at TDC, then go through the columns of piston travel until you find the number that is closest to the mm BTDC given in the manual. Then use the corresponding degree measurement to do the above calculations. Again, make sure that when you are rotating your flywheel in the direction shown by the arrow, your "fire" mark occurs before the TDC mark. The Bosch flywheels on Puch, Batavus, Derbi, Sachs, etc, make it easy because they have a 360mm circumference. 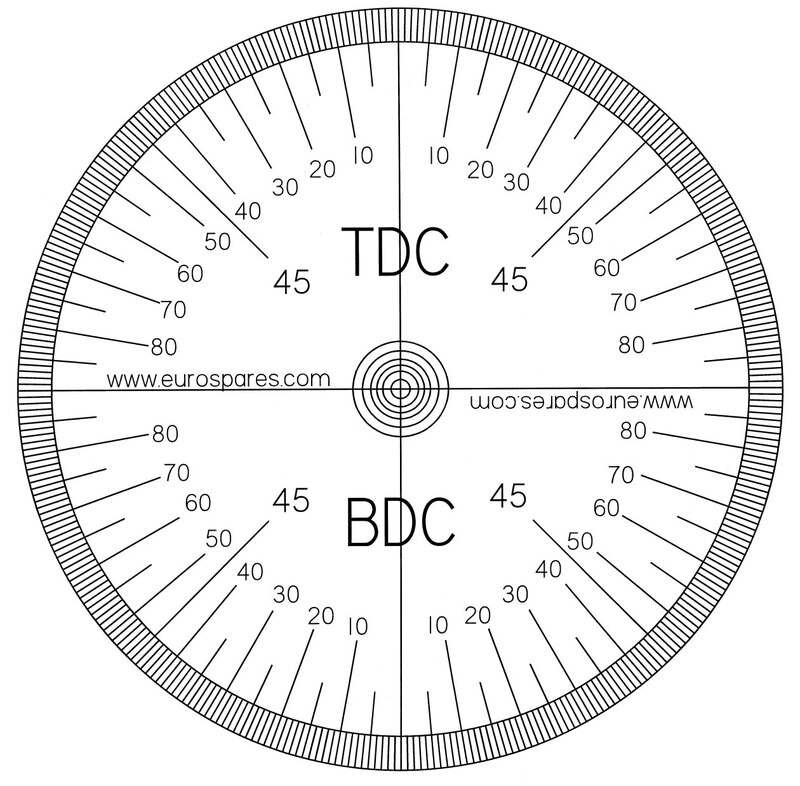 If you're aiming for 18° BTDC, just measure over the circumference 18mm from your TDC mark. If you don't want to do the math yourself, you can calculate how far to measure using this online arc length calculator. Measure the diameter of the flywheel, then divide by 2 to get the radius. Put that in the radius box, and enter the desired degrees BTDC (if you want 18° before TDC, put in 18). Hit calculate and check the solution to see what your calculated arc length is. Then, from your TDC mark, measure the specified arc length along the circumference of the flywheel in the opposite direction of normal rotation. This will be your "fire" mark. Hint: It doesn't matter whether you input inches or mm, but keep in mind that the output will be the same measurement. If inches in decimal form bother you, just measure the flywheel radius in mm and you'll get a distance to measure in mm. See this thread for more info. Lucky you, there are special resources for this engine. This timing chart converts degrees of rotation to mm and vice versa, making it that much easier for you to use either a timing tool, a degree wheel, or a measurement. There is also an extra-handy print-out that has all the measurements already made for you. For visual learners who like things simple, there is a video that gives one method of setting the timing on an E50. If you have found TDC, you can measure the diameter of your flywheel and that diameter is between 4 1/2 to 4 5/8 inches, you have access to a printer, and you don't mind if your timing is just a hair less precise than it would be if you used all the right tools and measured super carefully, then your best bet is probably to use this printout. First, line TDC mark on the printout up with the TDC mark on your flywheel. You will need to know the degree equivalent for the mm BTDC that you're aiming for, so if you don't know this, use the calculator linked above to find it. If you have a Puch E50, you can use the table in the article linked above. Then, if you know that your points are supposed to open at 22° (for example), then it's easy to see when the 22° mark on the printout lines up with your reference mark on the case. When they line up, your points should be opening. Again, make sure that when your rotate the flywheel in the direction indicated by the arrow, the points open before TDC. For more information on the printout, read the thread on the forums where this information originated. You can also use this super nifty degree tape to accomplish the same thing, except that it goes all the way around your flywheel, making it useful for porting AND ignition timing. At this point, you should have a mark on your flywheel that shows where TDC is, and another mark on your flywheel showing where your points should be opening. Now all you have to do is make sure your points actually open when they're supposed to (when the fire mark on the flywheel lines up with the mark on the cases -- if you don't have a mark on your cases, go back and read the TDC article). Of the four methods listed below, Methods 1 and 2 are more accurate and preferred over Methods 3 and 4. Using a meter, disconnect everything except the points and condenser from the ignition circuit. Connect one lead of the meter to ground and the other one to the points. Set to ohms, the meter will read open circuit (typically a “1” in the left side of the display which may or may not blink) when the points are open, and go to near zero when the points are closed. If the meter has a “continuity beep” or “diode test” function, use that instead. You would hear beeping when the circuit is closed and quiet when it is open. This makes it much easier to detect the exact moment the points open. Rotate the flywheel until the points open. Stick a very, very, very thin piece of paper (like a piece of cellophane from a pack of cigarettes) between the points. Rotate the flywheel until the points are closed over the paper. While pulling GENTLY on the paper, slowly rotate the flywheel in the direction indicated by the arrow. You will know when the points just begin to open because the paper will slip out from between the points. Stare at the points as you rotate the flywheel. At some point, you will see them open. Rotate the flywheel back and forth until you think you have isolated the point where they are just starting to open. Now you know where your points are opening. If they are opening when your Fire mark is lined up with the mark on the case, then yay, you're done! If not, then you should rotate your stator plate until the marks do line up. If the points open too soon (before the Fire mark), your timing is too advanced, and you should rotate the stator plate in the same direction as the arrow on the flywheel. If the points open too late (after the Fire mark), your timing is too retarded, and you should rotate the stator plate in the opposite direction as the arrow on the flywheel. By rotating the stator plate bit by bit, you should generally be able to get your points opening when the fire mark lines up with the mark on the case. If they absolutely won't line up no matter what you do, you can re-set the point gap to be slightly bigger or smaller, or you can dremel out the mounting holes in the stator plate so that you can rotate it more. This entire process can be repeated using a tire tread depth gauge as follows. The steps/concepts are the same as those listed above, determining when the points should open, and making the points open when they should. Clean old points contacts or install new points, re/adjust them by turning the flywheel till the contact points are open at their widest and gap new points at 0.017" to 0.016" used points, 0.018" to 0.017". Grind or file the side tabs/wings down on the tire tread depth gauge till it clears the cooling fins at the spark plug hole and the base of gauge shod sit flat on the spark plug hole. Hold the tread depth at the spark plug hole and push the center of the gauge down into the cylinder. Spin the flywheel by hand two revs wile holding gauge tight against the cylinder spark hole. Remove gauge and note gauge reading, now increase the gauge reading by 2/32" or factory spec (ignition advance spec, in mm BTDC) and place a piece of tape on the gauge to hold new gauge setting. Now hold the tread depth at the spark plug hole and turn flywheel very slowly in the same direction it spins when trying to start it till it just touches the tip of the gauge, this is where the points should just break open. If your using a timing light put a mark on the flywheel and engine case, to check and set timing. If they don't open at this point, or your marks don't lineup when using timing light, adjust the stater plate or point gap and repeat step #6 or #7. Note: a tire gauge is fast and 2/32"= 0.0625" = 1.5875mm will give approximately 18° BTDC; to 19° BTDC; on most mopeds. This measurement will work fine for most moped timing needs. 1/32"= 0.03125" or 0.79375 mm = will give approximately 15° BTDC on most mopeds. This article outlines only a few timing-setting methods. There are MANY other methods, some of which are probably more correct and some of which are probably less correct. If you have a different method that you like better, please add your method to this page. Hopefully as more people edit, the information here will improve and be condensed until a correct, concise, and understandable ignition-timing-setting method emerges. All of these are linked above somewhere. This page was last modified on 26 July 2014, at 18:33.